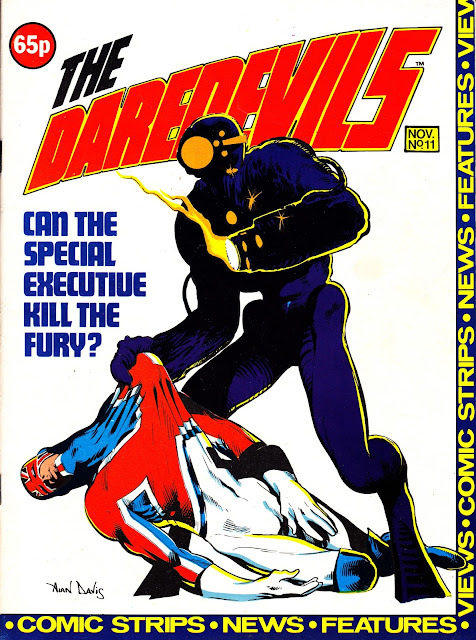 From November 1983: MARVEL UK's THE DAREDEVILS closes after a mere 11 issues. This is probably one of the most famous failures in the whole pantheon of British Marvel books... and let's be frank... there were an awful lot of short-run titles in the 20+ years the British Bullpen was open for business. One of the funny things about the failure - and subsequent merger with (the revived) MIGHTY WORLD OF MARVEL is that it didn't transfer the title star in the merger. Frank Miller's DD didn't make the cut. And the tie-up also sqeezed out the new X-Men, stars of MWOM. Clearly critical success did not automatically secure you a place. 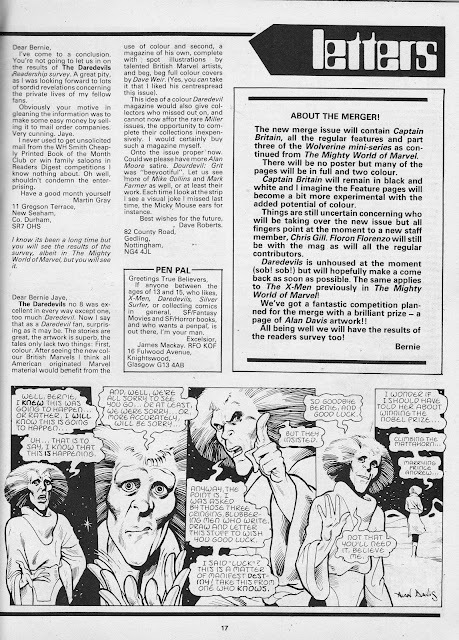 Captain Britain, the main selling point of The Daredevils, did fortunately make the cut. Which is surprising considering Marvel UK's accountants were always looking at ways to end expenditure on new material in favour of freebie reprints. The makeweight strip - Sixties Spider-man adventures, rehoused from the SPIDER-MAN POCKET BOOK the previous year, never stood a chance. I must admit that - at the time - I rather liked the results of the merger. And I still think the new MWOM was one of the stronger titles M-UK ever published. Shoddy printing not withstanding. I think the combined line-up pulled together the best of both worlds and - at the time - I lapped up the fanzine reviews (no longer written - like much of the original content in The Daredevils - by Alan Moore), the reprints of hard-to-find US limited series, the (just reprinted) Night Raven text stories and the showcase feature (my first introduction to H.M.S Conqueror, Britain's STAR TREK knock-off).